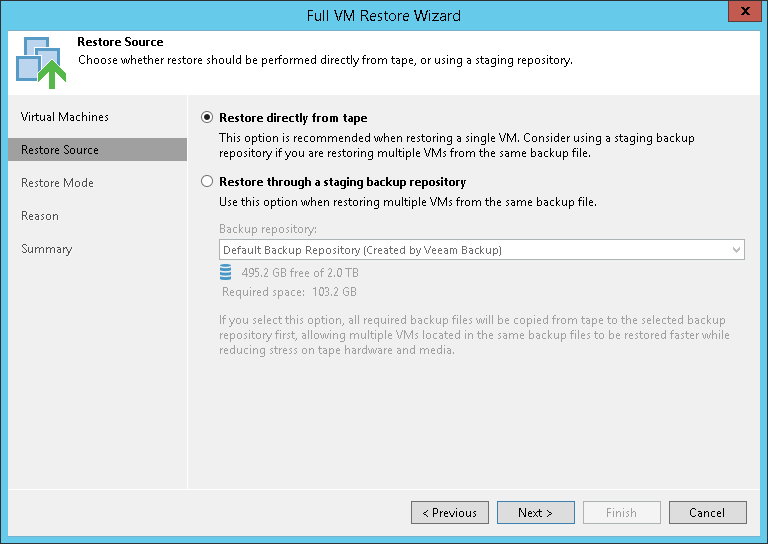 Select Restore directly from tape if you want to restore VMs without a staging repository. In this case, the restore job will read data directly from tape. Note that restoring VMs directly to the infrastructure may be slow if you restore a lot of VMs simultaneously. Select Restore through a staging repository if you want to temporarily copy the tape backup to a repository or a folder first. The restore job will copy the backup to the selected destination and launch a standard restore VM from disk process. From the Backup repository list, select the repository that should be used as a temporary storage (staging area) for machine backup before the VM is restored to the virtual infrastructure. You can also select a target folder on any server connected to Veeam Backup & Replication. To do so, choose the Select folder option from the Backup repository list and choose the location to which backups should be restored before full VM recovery.